The Pharmaceutical Student Union has since 1912 had an inspector who acts as a mentor for the Union's officers. The Inspector also creates a good contact with the Faculty while maintaining the tradition and continuity in the Union's activities. During the November meeting in 2013 the Pharmaceutical Student Union also established a proinspector post. Inspector and proinspector are chosen by the Union's meetings among the Pharmaceutical Faculty's teachers for a period of five and three years. To be appointed as a inspector/proinspector, the candidate should have at least 4/5 of all votes cast at the Union meeting. As an inspector and a proinspector you should care for anything that can help promote the Union's activities and objectives, and shall ensure that the Union's statutes are complied. Anders Karlén is a professor at the Institution of Pharmaceutical chemistry, the Department of Organic pharmaceutical chemistry. Anders was during his time as a student very active in the Pharmaceutical Student Union where he in 1983 was the President of the Education- and Social committee (it is now known as VicUt) and later Vice President of the Graduate student committee during three years (1985-1987). Anders has since his dissertation at the Faculty in 1989 mostly worked at Uppsala University. During his time at the University, he has become a recognized researcher with a large network at the same time that he has demonstrated commitment to the Faculty's courses, including many years in GRUFF. He has been appreciated as a teacher and in 1999 he got the Student Council Award for student influence. Anders has also been involved as a volunteer, mainly, he has for many years been President of the Division of medicinal chemistry in pharmaceutical sciences. Anders was elected Inspector at the November meeting in 2014 and was installed at the Pharmaceutical Student Union's Autumn Prom the 21 November 2015. 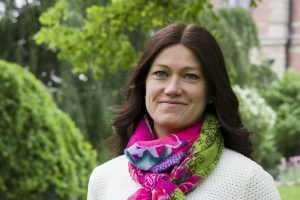 During the May meeting in 2014 Dr. Anja Sandström was elected the first Proinspector at the Pharmaceutical Student Union with the following motivation. Dr. Sandström is an associate professor at the Institution of Pharmaceutical chemistry, Department of Organic chemistry. Anja has, as a very appreciated teacher, shown great interest to students of the pharmaceutical programs. Anja has been rewarded with the Student Council's Teaching Award for her work in 2013, as well as the Study Council Award for Student Influence in 2009 and 2012. Through her involvement in GRUFF and StuRe, she has a good insight into the programs design and the pharmaceutical professional role.